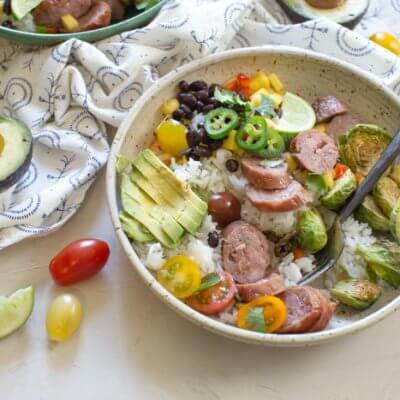 Chicken Mango Power Bowls a healthy weeknight dinner with chicken sausage, roasted Brussels, avocado, mango, rice, beans and fresh tomatoes. Preheat oven to 375 degrees F. Line rimmed baking sheet with parchment paper and arrange evenly with brussels sprouts and sausages. Drizzle with olive oil, salt and pepper. Bake 20-25 minutes until brussels sprouts are roasted. In a large bowl, mix together beans, pineapple, mango, bell pepper, jalapeños, and lime juice. Prepare 4 bowls by layering rice, chicken sausage, brussels sprouts, pineapple mango mixture, tomatoes and avocados.